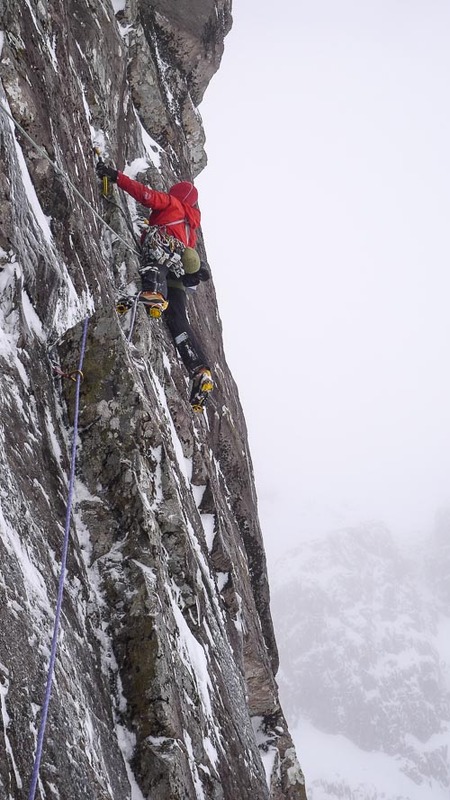 I was rather surprised to hear that Murdoch Jamieson and Iain Small climbed The Duel (IX,9) on Stob Coire nan Lochan before Christmas (December 16) and found it rather testing. Now The Duel is a hard route for sure, but it has seen a number of repeats now, and should have been well within the capability of a team as able and active as Jamieson and Small. The mystery was solved a few days ago when it transpired that Murdoch and Iain did not climb The Duel after all, but made the first winter ascent of En Garde instead. En Garde, which starts up the first pitch of The Duel and then continues directly up the second to gain a steeper parallel ramp, was first climbed in May 1980 by G.Rooney and Ian Dalley in May 1980. It is graded E1 in summer and has seen very few repeats. “Iain led the introductory pitch to below the ‘wall pitch’ of The Duel,” Murdoch told me. “Then I led the ‘wall pitch’ crossing the overlap and into the groove. From there I just followed my nose, totally unaware that The Duel traversed out right. There was an old peg on the left wall, which had seen better days, so I backed that up with a cam and just assumed the route continued up the obvious line above! Tricky, thin committing moves above the peg gained a belay ledge. I was aware that this was meant to be a long pitch of 40m… Iain shouted up that I had only done 30m or thereabouts so I just continued up the corner. This was pretty steep with only a poor peg and cam to protect it so it felt rather exciting for me. Above this, I reached a turfy ramp and belayed below an overhanging chimney (again this all fitted in with my thoughts that we were on The Duel). Iain followed and led the chimney. We had taken a big cam especially for this, however despite the steep chimney being strenuous’ it had positive placements. This entry was posted in New Routes and tagged Iain Small, Murdoch Jamieson, Stob Coire nan Lochan. Bookmark the permalink.